Malham Tarn House estate book maintained in manuscript by Walter Morrison circ. 1873 / 1874. In two segments. Particulars and conditions of sale of farm and lands at Kirkby Malhamdale dated 20 August 1851. 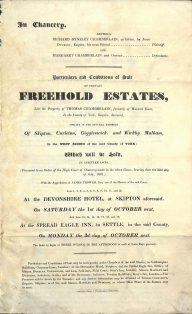 Particulars and conditions of sale of estate including Kirkby Malham dated 1 October 1831. Late the property of Thomas Chamberlain of Halton East. Particulars and conditions of sale of estate including Malham Moor dated 9 November 1889. Late the property of Thomas Chamberlain. Particulars and conditions of sale of Malham Tarn House estate dated 28 July 1944. By direction of Mrs V H Hutton Croft. Undated survey notes for Malham Tarn House estate. Particulars and conditions of sale of the Eshton estate at Gargrave dated 1960. By Direction of Sir Matthew Martin Wilson Bt. In four segments. 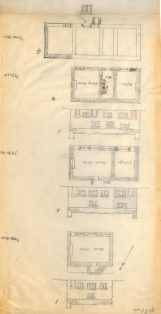 pencil sketch plan of cottages on Malham Tarn House estate – undated. File of documents relating to Kirby Malhamdale United School Charity including Charity Commission schedule dated 18 November 1873. In two segments. Particulars and conditions of sale of estates including Malham Moor dated 4 November 1889. Formerly the property of the late Walter Morrison Esq. Particulars and conditions of sale of Capon Hall farm; Chapel Fell, Malham Moor; 85 sheep gates on Black Fell dated 14 June 1963. By direction of the William Ingham Trust. Transcripts made by Arthur Raistrick in the early 1960s of twenty five 17th and 18th Century deeds, wills, mortgages etc. relating to Malhamdale.